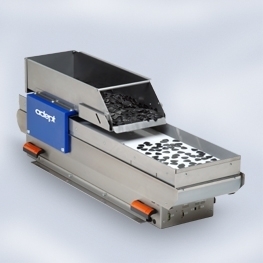 The anyfeed 120, FX180, and FX240 are a family of programmable bulk part feeders from flexfactory. The feeder is used in combination with a robot/gripper, and a machine vision system to from a flexible bulk part feeding system. The specific function of the feeder is, to manipulate the parts into stable states from which the robot with its gripper is capable of picking them up. The machine vision system is used to control the part flow in the feeder and to identify and located the kickable parts. A 4 to 6 axis robot is typically used to pickup the parts from the feeder. motions. Copyright © 2004-2010 - Innovation Matrix, Inc. - All rights reserved.